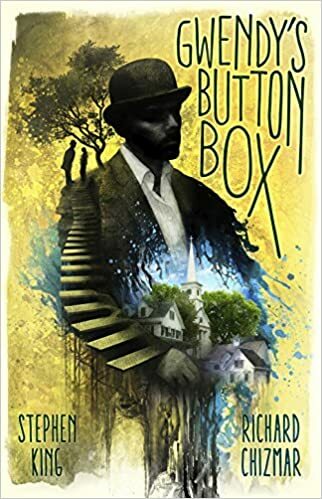 Gwendy’s Button Box is a novella written by Stephen King and Richard Chizmar, published by Cemetery Dance Publications. Gwendy is a middle-schooler living in Castle Rock in the 1970s. She is not happy with her life–she never feels quite smart enough, quite thin enough, quite popular enough. She is trying to make her life fit her expectations better, sprinting up the steep Suicide Stairs to try to lose some weight, where she meets a mysterious stranger who gives her the titular button box. If he is to be believed, the buttons lining on the box would have catastrophic consequences of unbelievable, except the red button whose consequences are of a more negotiable scope. It also produces an apparently endless supply of chocolates that are both amazingly delicious and they also quell appetite, as well as valuable antique coins. He leaves her with the box, and she is left with the choice of whether and when and how to use it. I love the cover art of the book by Ben Baldwin, with the incorporation of the suicide stairs into the man’s arms and the silhouettes at the top. This book feels very familiar, after reading almost all of Stephen King’s previous works. Castle Rock is a recurring setting. The mysterious man is probably a recurring character (I say probably because I’m not sure his stated name is exactly the same but shifting names are also a characteristic of this character). The overall theme of being tempted with everything you desire without fully understanding the price is a recurring theme of King’s books. Unfortunately, I didn’t feel like this one lived up to its potential. With a vast bibliography like King has, self-competition does become a problem. This, to me, felt too much like Needful Things, one of King’s best works, which did the theme much more thoroughly, much better, and at a length that King is (in my opinion) better at. The premise here was reasonably interesting, and solid, but King’s by-the-pants no-outlining writing style reared its head here, because the book rises and rises and then just kind of peters off at the end. I love the cover, I would hang that cover on my wall, and if you haven’t read tons of King’s other work, this might be appealing on its own despite its weak ending, but competing against the history of King’s own work, you could pick up quite a few of King’s other books to get the same feel of this one but better.